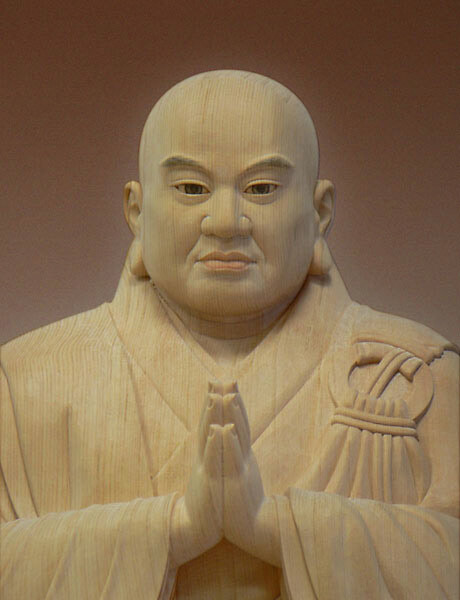 Nichiren Shonin, the founder of Nichiren Shu, was born on February 16, 1222 in Kominato, in what is now Chiba Prefecture in Japan. At the age of eleven, his parents sent him to a monastery to study. From an early age, he began to wonder why there were so many schools of Buddhism, while the Buddhism expounded by Shakyamuni Buddha was but one. He was ordained as a priest at Seichoji Temple at the young age of 15. After considerable study at the centers of Buddhist scholarship, Nichiren Shonin concluded that the Lotus Sutra indeed represented the perfect culmination of the true teaching of the Buddha. Nichiren Shonin found that he was ready to embark on his plan of reformation with the proclamation of his new gospel. He made his grand declaration in the early morning as the sun broke through the morning haze at Seichoji on the small mountain of Asahi-ga-mori. He chanted the Odaimoku, Namu Myoho Renge Kyo. This was Nichiren’s proclamation of his gospel to heaven and earth with the all-illuminating sun as his witness. The date was April 28, 1253. Soon after that, he went to Kamakura, the seat of the Shogun, and began preaching the Lotus Sutra. Discord prevailed among the governing clans with widespread rumors predicting tremendous civil unrest. In addition, the nation was suffering from a series of typhoons, floods, and earthquakes, along with famine and rampant plague, and fear-provoking comet sightings. All of these occurrences drove the people into panic.